Designer and Teacher for the love of animals and the yarn they produce! 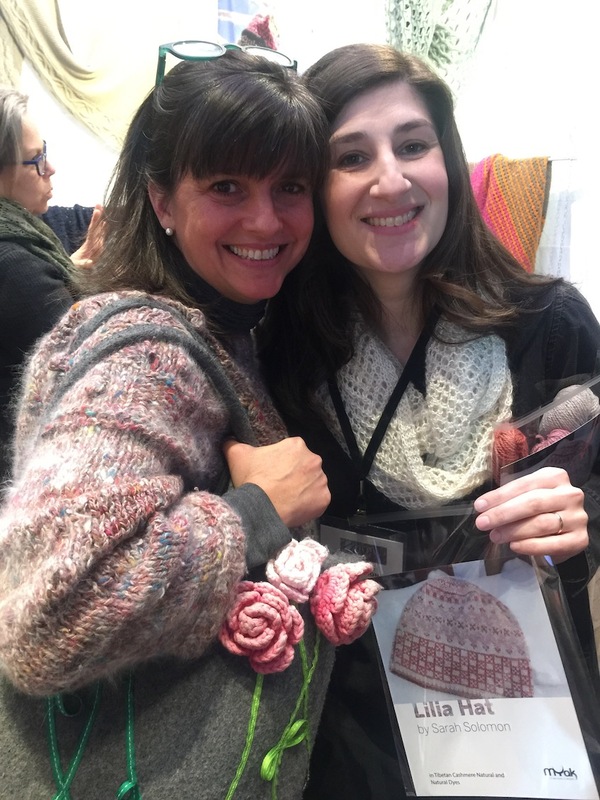 Sarah Solomon is a much sought-after knit wear designer and teacher across the U.S. that I was lucky to interview for our Pink Imperfection community. 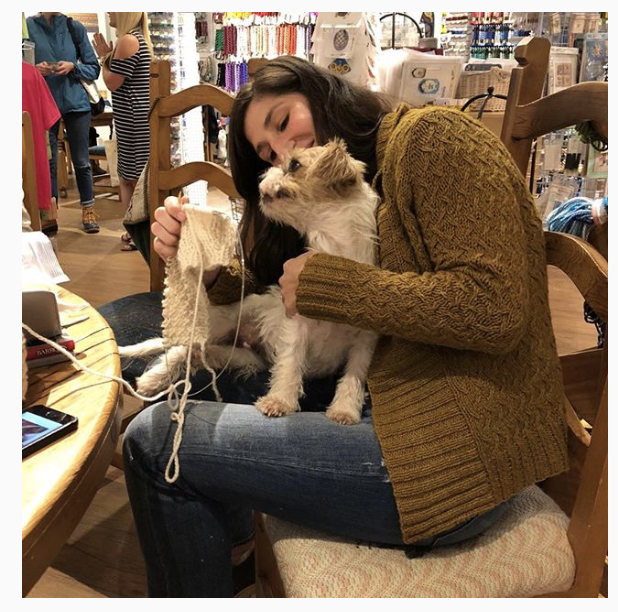 She shares with us how she became addicted to knitting and grew closer to her Mom, Philippa Solomon, through their knitting class at FIT (Fashion Institute of Technology) in New York City. From England to New York City. Where it all began. 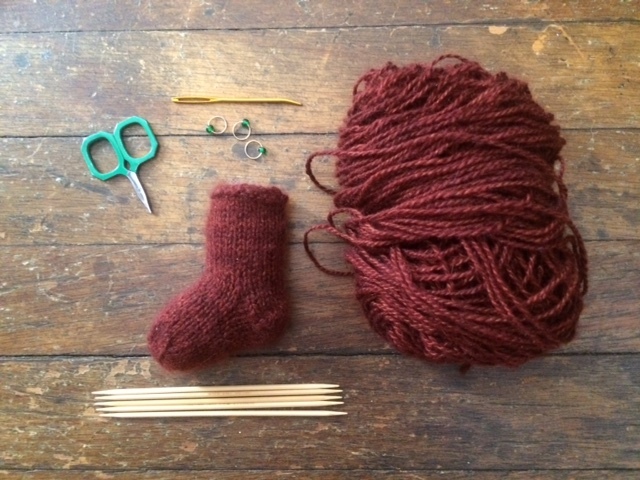 Sarah’s mom, Philippa, started knitting at age 4 in England where she grew up and was taught by her father. They had a lodger in their home who Sarah explained was instrumental in her mom’s knitting education. Auntie Janet, as she was known, was knitting a sweater for her fiancé and allowed Philippa to knit on the sweater. This expedited Philippa’s focus to become extremely good with her knitting at an early age because she wanted it to look as nice as Auntie Janet’s stitches! Philippa suspects that Auntie Janet might have taken out her work at night but being given something so important to knit on sparked a serious passion for knitting. Growing up in England in the 50’s with no central heating, keeping warm and wearing wool to do so was a natural part of most people’s lives. British women knit everything from sweaters to socks to underwear, partly for pleasure but partly to actually keep warm. There was a very practical slant to the knitting of that time. By the time Sarah was born, her mom was no longer knitting as much, but at that period was focused on quilting. The presence of fabric and a sewing machine led Sarah to sewing first and she became quite serious about it, but she had a long history of back problems and the sewing was killing her back. So, Sarah went in search for a new hobby for her hands that was creative but not literally back–breaking. Sarah looked to her mom to teach her knitting, Philippa had knitted for so long, she could not explain it to Sarah with words and Sarah could not learn simply from watching. A friend convinced Sarah to take a knitting class at FIT (offered by continuing Ed) in the wearable arts department. Six weekly sessions with a wonderful teacher that has since retired, and Sarah was hooked immediately after the first class. “I loved making fabric with my hands vs. making things from fabric. Actually forming the stitches was mesmerizing. 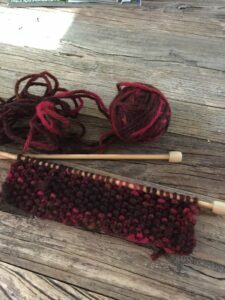 I loved the variety of textures you could achieve and started exploring stitch patterns right away.” Thus, began Sarah’s love for reading pattern and stitch books. From here Sarah convinced her mom to join her in taking the second level knitting class at FIT. The weekly class got Philippa back into knitting and began a new era of mother and daughter knitting together. “When I first started knitting, I only wanted to knit sweaters. My first project was a sweater – even though all the voices around me said, “ DON’T start with a sweater!” And my mom’s help was the only way I got through it—I found pattern instructions so foreign and I needed her to explain practically everything to me. Because Sarah already sewed clothes, she immediately started creating her own patterns. “I found patterns confusing and at the time I didn’t see the kinds of garments that spoke to me. I had strong ideas about what I wanted, so I thought it might actually be easier to start making simple sweaters my own way. My mom showed me how to look at sweaters in my closet, literally counting up stitches and looking to see where there were increases and decreases.” From here Sarah’s designing knitwear was born. Given Sarah’s background and the influence of her mom, she is looking forward to designing her ideal beginner class which would get students started inventing their own projects as soon as possible. Sarah’s passion is to teach from the beginning how to be more self-sufficient, giving knitters control from the first cast on. This has led Sarah to work with amazing fiber companies large and small that are dedicated to humane care of the animals, value their fibers and give back to the artisan communities. Companies that Sarah is actively working with today include mYak, Cashmere People and Manos del Uruguay. Sarah met Puala of mYak at Vogue Knitting Live a few years ago. “I couldn’t leave her booth without touching all the yarn. It was just so unique. The same thing happened with Casey at Cashmere People. When a yarn is processed in such a way that I still sense the animal it came from, that’s what draws me in.” Sarah will be teaching a sock workshop using Cashgora from Cashmere People sponsored by Pink Imperfection and hosted at the Greenwich Historical Society on Sunday, February 10th. You can reserve your spot here! Sarah met Manos del Uraguay at TNNA. They are a nonprofit that helps rural Uraguay women find sustainable work using their artisan skills. Fibers are shipped to the rural areas so women don’t have to leave their villages. Sarah created a sweater collection for them released this past Fall and she will be doing a presentation about the collection and the history of the company in February at Knitty City. (February 7th – 6:30). The entire collection plus Sarah’s previous samples for Manos will be there to try on and see up close. Sarah believes that whenever possible we should use the best quality materials for our knitting projects and celebrate brands that try to insure that everyone in the chain of production has the best life possible. Why knitting should survive in today’s world? 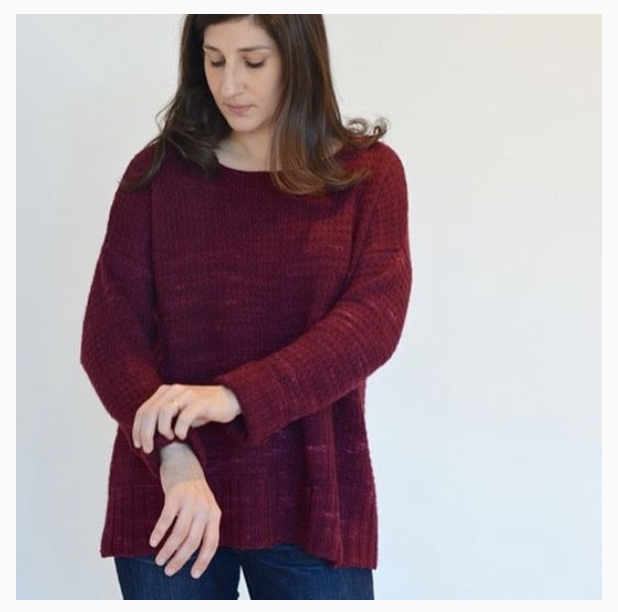 Given Sarah’s passion for sweater knitting, she is currently developing a sweater knitting workshop in the short class format – clever ways to learn all the skills you need to make a sweater but can learn them in one 3-hour class. Of course if you have taken a class from Sarah, you will probably agree with me, it is ok if it takes a full day hanging with Sarah! In her personal time Sarah also enjoys hand spinning and she’s reached the stage where, as a teacher, she’d like to bridge the gap between spinning yarn and knitting, helping spinner’s figure out what to do with their hand spun or how to spin for particular knitting goals.